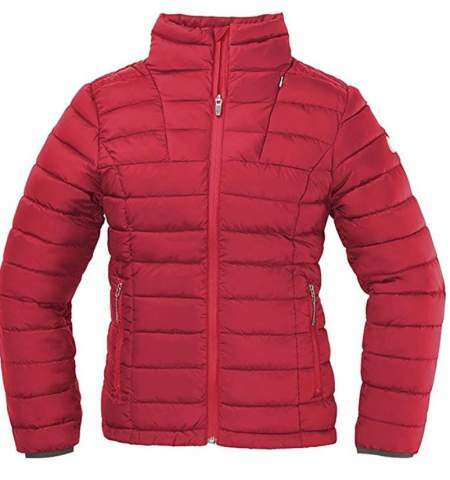 Here you have the Best Down Jackets For Women that are on the market for the 2019 season, all top models from renown brands with high-quality materials. 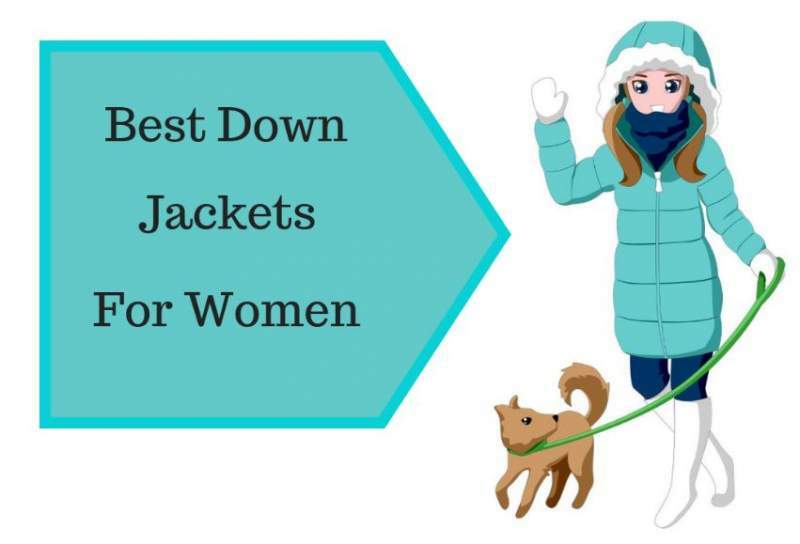 Best Down Jackets For Women. You will realize from the shape of the jackets that some of them are designed as outer layers only. But most of them can be used both as outer and inner layers. You have hip-length, waist length jackets, and parkas. All are windproof, mostly water repellent, and there are some that are also fully waterproof. All of them are from the top brands in this industry. The fill is down of course, from 650 and up, and all jackets are built from advanced materials. Big Agnes Women’s Shovelhead Hooded Jacket. This jacket comes with the 700-fill DownTek insulation which is a treated down with an all-weather reliability and a great compressibility. This is a down with a hydrophobic finish applied to each individual plume of the down used in the fill. With this, the down stays dry longer and it also dries faster than untreated down if it gets wet. It also retains 98% of its loft and this implies that it maintains its warmth. In order to increase its thermal features, they apply what they call the Insotect Flow design. It eliminates cold spots and offers a better heat distribution, and it regulates the movement of the down inside the baffles. They use the Flow Gate construction which prevents lateral and vertical down shifting, so you have chambers with gates that keep the down in place. The shell fabric is a nylon ripstop and you also have the insulated hood with the same material. The jacket has a storm flap behind the front full-length zipper, and the hem is with a drawcord hem. Note also that you have integrated thumbholes visible in the picture above. The jacket is with 5 pockets, and these include two zippered handwarmer pockets, two large interior mesh pockets, and one chest pocket that doubles as a stuff sack. Note that all zippers are the top quality YKK Vislon. This is a semi-athletic fit and the average weight is 15.5 oz (440 g). The jacket is great for backpacking, hiking, snow sports, and for casual use. Currently, it is available in three colors. Marmot Women’s Quasar Nova Hoody. The Quasar jacket by Marmot has been on the market for many years already. This Nova appeared a year ago with some modifications. This is a premium 800-fill goose down insulation jacket which delivers great warmth while being incredibly compressible and lightweight. It weighs only 10 ounces (283 g), hard to believe. The shell is a 20D nylon with horizontal baffles so this partly behind such a great weight. You have an attached insulated hood with elastic binding. The hem is with an elastic drawcord hem and the cuffs are also with elastic. The fit is regular and with what they call the Angel-Wing construction, a patented design which provides more fabric on the back for a non-restricted movement. The center back length is 24.5 inches (62 cm). 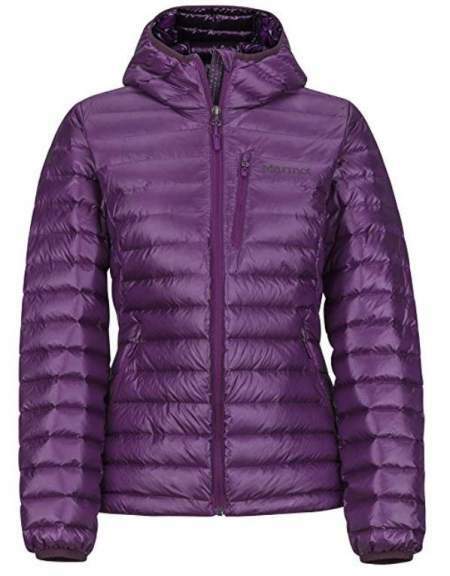 The Marmot Women’s Quasar Nova Hoody is suitable for hiking, climbing, backpacking, snow sports. 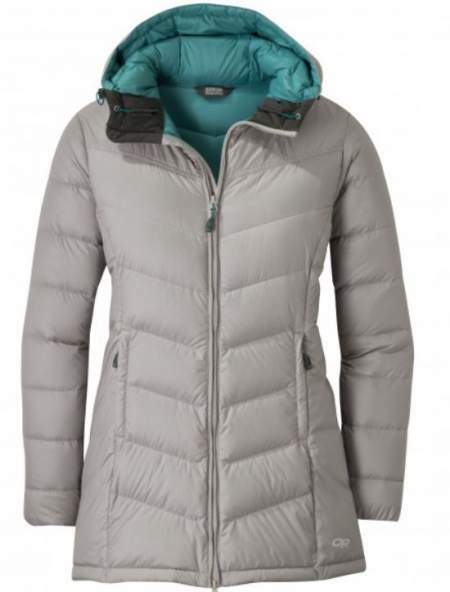 Montane Featherlite Down Jacket for women. This lightweight Montane Featherlite Down Jacket looks similar to the Quasar jacket above, but here you have a 750-fill water-resistant HyperDRY down. This is a hydrophobic treated down that keeps its insulation and loft if it gets wet. They claim it is Responsible Down Standard (RDS) certified. The outer shell is a lightweight 100% windproof Pertex Quantum rip-stop nylon with a superior DWR. So this is not a fully waterproof fabric just to know. The hood is a roll-away type, with adjustability on the sides and on the back. This jacket has 3 pockets in total, two zippered hand pockets, and one internal chest pocket with a Velcro closure. Note that it comes with its own stuff sack. Note that the zippers are YKK. The jacket is with a full-length zipper and articulated sleeves. The hem is with a drawcord and this is an active fit that allows for layering underneath it. The average back length is 25.2 inches (64 cm). The jacket is most suitable for hiking, backpacking, climbing, and snow sports. 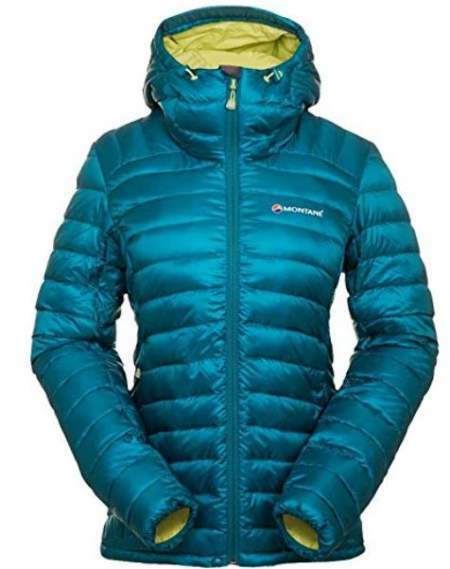 Mountain Hardwear StretchDown Jacket for women. If you are curious what is so special about this jacket here it is – the baffles which you see in the picture are not made by stitching, they are welded instead. So although it may look just like any down jacket, it is in fact rather technical. You have down that is water-resistant, baffles are unique, and as the name suggests it is stretchy. The shell is 100% polyester Dynamic-Stretch knit. Because it is stretchy, it does not have to be oversized to fit you perfectly, so it does not constrict your movements. It simply moves with you. They have welded the baffles so that the stretchiness is preserved, with stitching this would not be so. Because of such a technology, there are no holes in the fabric and plumes will not start coming out. The insulation is a lightweight and compressible Q.Shield 750-fill power down. Being treated, it retains its insulating features even when wet. The fill is fluffy and it is kept inside the welded channels, so the body heat is preserved and trapped. The cuffs are elastic, and the hem is as usual with a drawcord. The jacket has 5 pockets and those include two zippered hand pockets, one zippered chest pocket, and two interior pockets. The jacket is currently available in 7 different colors. All in all, this is an active fit with 25 inches center back length, a jacket for hiking, snow sports, and for casual use. Outdoor Research Alpine Down Hooded Jacket for women. This OR Alpine jacket is designed for extreme conditions and as an outer layer, I think it is too bulky for any other use. It looks bulky but here you have a premium 800-Fill Power Goose Down insulation and this means it is very compressible and lightweight, it weighs only around 17 ounces (482 g). It is also nicely packable and indeed it packs into its own left-hand pocket. In such a state you can use it as a pillow in the camp. The shell is the 15D Pertex Quantum Y Fuse nylon in the main body, and 30D Pertex Quantum Pro is used on the upper parts, on the sleeves, and on the hood. The jacket is water- and wind-resistant and with dynamic reach underarm panels. The hood is completely adjustable and helmet-compatible, with integrated cord lock on the back. With this, you can reduce the center back neck up to 4 inches (10 cm). The cuffs are with Velcro tabs and as usual, you have a drawcord on the hem. There is a storm flap behind the full-length two-way front zipper. In fact, it looks more like a draft tube in a sleeping bag. The jacket has 6 pockets in total. These include two zippered hand pockets, one zippered external chest pocket, one zippered internal chest pocket with a port for electronics, and two large internal shove-it pockets. As you see from the picture, the hand pockets can be used even with a harness or hip belt on. All in all, here you have a versatile jacket for winter backpacking, alpine climbing, snowsports, and you name it. They claim this is the warmest jacket ever made by the Outdoor Research brand. The fit is standard and it allows for layering. The center back length is 27 inches (69 cm). Outdoor Research Women’s Floodlight Down Parka. This OR Floodlight Down parka is exceptional in several ways. But let me stress first that this is a fully waterproof and insulated as well. This is due to its shell material which is a 2-layer Pertex Shield, 100% nylon 30D ripstop. This is a breathable but waterproof material. But note also that there is no stitching, the baffles which you see in the picture are not stitched but bonded. So this is everything but ordinary down jacket. However, different pieces of the jacket are naturally indeed stitched together, like arms that are stitched to the jacket’s body, but there you have all stitching zones taped for a full protection. The insulation is a premium 650 Fill Power Goose Down. This is a parka so it weighs around 20 ounces (567 g), so it is still very lightweight. The hood is helmet compatible, insulated, fully adjustable, and equipped with a wire-brim. The front zipper is two-way type so you can open it from any side, and this is suitable because of the length of the jacket. They use the best quality YKK AquaGuard Vislon zippers. There is an internal storm-flap behind the front zipper. On the cuffs you have Velcro tabs, which is very convenient when you use gloves, you can put the cuffs over them easily and cinch down. There are 5 pockets in total, two hand pockets with zippers, one chest zippered pocket, and inside you have two shove it pockets. The fit is standard and comfortable due to Dynamic Reach underarm panels. The length is 30 inches (76 cm). Outdoor Research Women’s Transcendent Down Parka. This Outdoor Research Women’s Transcendent Down Parka comes with a 650-fill down insulation, the same type which you have seen in their Floodlight jacket above. This jacket has been around for many years already. But in this new collection, the shell fabric is changed and the baffles are bigger. So the shell is a 100% polyester 20D ripstop, wind- and water-resistant but not waterproof. The hood is fully adjustable and with the drawcord on the back. You have 3 pockets here, two zippered hand pockets with a pleasant brushed lining, and one internal zippered chest pocket. It packs into its own pocket. The main front zipper is a two-way type and with an internal storm flap. The cuffs are with elastic. This is a very stylish, long and warm jacket with the center back length of 27¾ inches (70 cm), and very lightweight as well, the average weight is 11.5 oz (326 g). 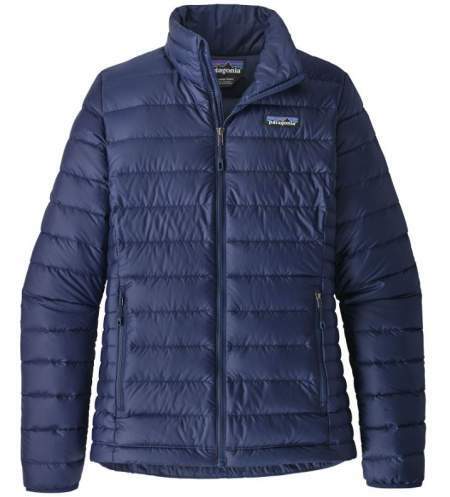 This Patagonia Women’s Down Sweater is very lightweight and it fits perfectly under a rain shell jacket, yet it can be used as an outer layer as well. The insulation is a high quality 800 fill traceable goose power down for a reliable warmth in a cold environment. The shell is a 1.4 oz 20 x 30D 100% recycled polyester ripstop with a durable Patagonia’s Deluge water-repellent finish. The liner is a 1.5 oz 22D 100% recycled polyester ripstop, also with the same DWR finish. The jacket has 2 hand pockets with water-resistant zippers, plus an internal zippered chest pocket and it stoves in it. The cuffs are elastic and you have a drawcord hem with cords on both sides and a nice feature is that the adjustment toggles are in the pockets so nothing is hanging on the sides. The fit is regular, perhaps a bit on a relaxed side and it allows for layering. It is a hip-length, and the jacket weighs 12.2 oz (346 g). I see it best suitable for hiking, backpacking, and for casual use. 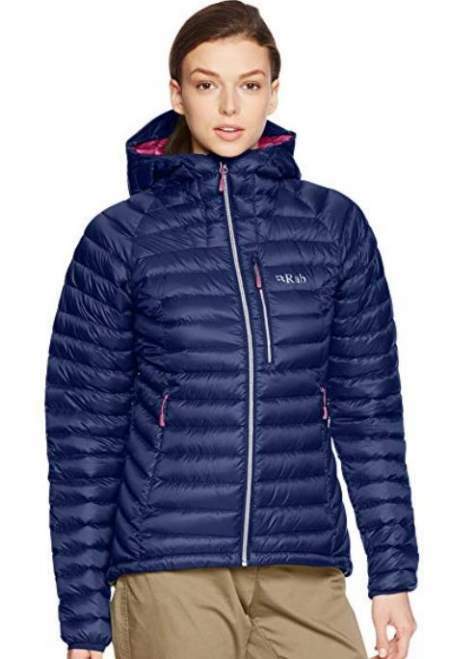 Rab Women’s Microlight Alpine Jacket. This Rab Microlight Alpine jacket has been around for at least a decade already. But here you have the new version of it and it is better than ever. You have 4 panels now, one on the front, one on the back and two on the sides. It fits better and it is warmer now. The insulation is a lightweight and very compressible 750-fill ethically-sourced European goose down, 135 g (5 oz) in the size 12. This is a fluorocarbon-free hydrophobic down with Nikwax treatment. The shell is an ultra-lightweight Pertex Quantum fabric, wind- and water-resistant and breathable nylon material. The hood is fully insulated and you can use it over the helmet. If you use it just on the head, it will fit nicely because of an elastic on the back. It has a built-in brim. Two drawcords for adjustment are on its sides. There are 3 pockets, two zippered hand pockets, and one zippered chest pocket. Note that the jacket comes with a stuff sack included. There is an adjustment toggle on the hem and the cuffs are elastic. This jacket is with a slim fit, hip-length, and it can be used underneath a rain shell jacket and it can also be used as a standalone jacket, it allows for some layering. This is a piece suitable for everything from hiking and climbing to around town use. The average weight is 15 oz (430 g), the zippers are top quality YKK. 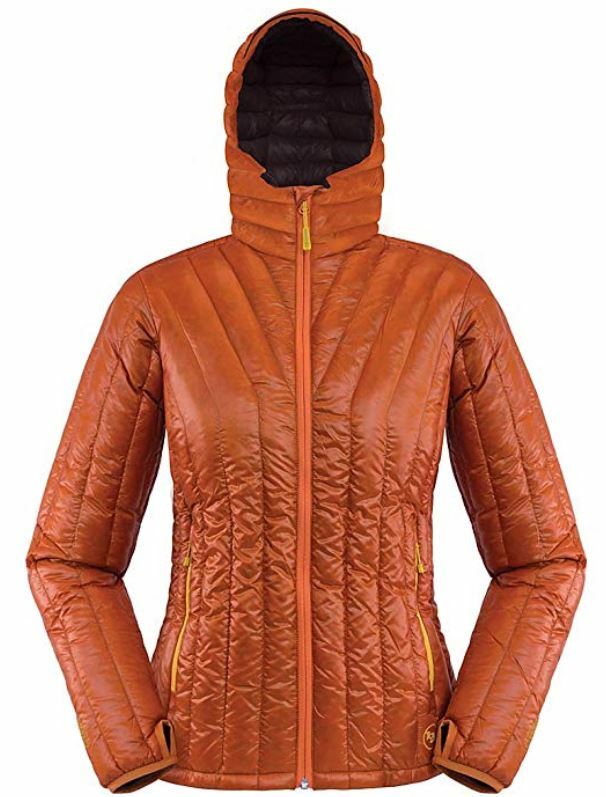 Sierra Designs Women’s Sierra Jacket. 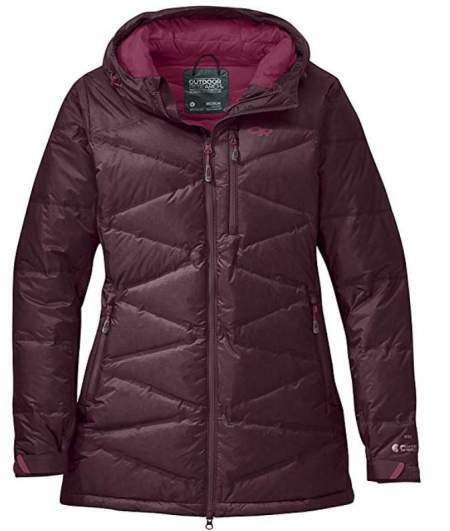 The Sierra Designs Sierra Jacket for women is filled with a high quality 800 fill DriDown. This is a down with a unique, innovative polymer application that creates a hydrophobic finish on each individual plume of down. As a result, you have an insulation that stays dry 10 times longer and dries 30% faster than untreated down. In addition to this, such a treated down retains 2 times more loft than untreated down. The shell is a 40D polyester ripstop, lightweight but strong enough to protect the insulation. The liner is very soft and pleasant next to the skin. There are 4 pockets, two zippered hand pockets, one secret external chest pocket, and one large inner kangaroo pocket. Note that the jacket stows into one of the hand pockets. One great feature you have inside the cuffs – there you have stretchy mini sleeves that fit tightly around your writs and prevent any cold drafts. Note also that this is a very affordable jacket. 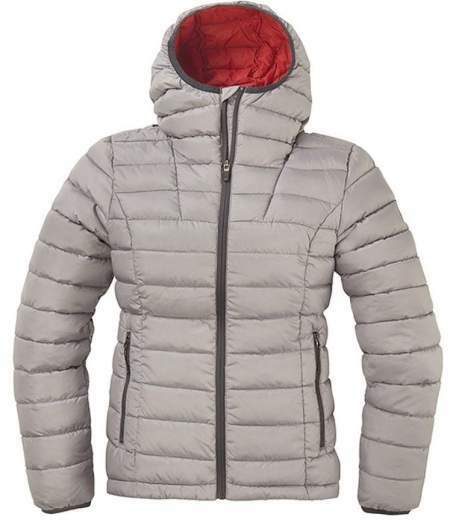 Sierra Designs Women’s Whitney Jacket. 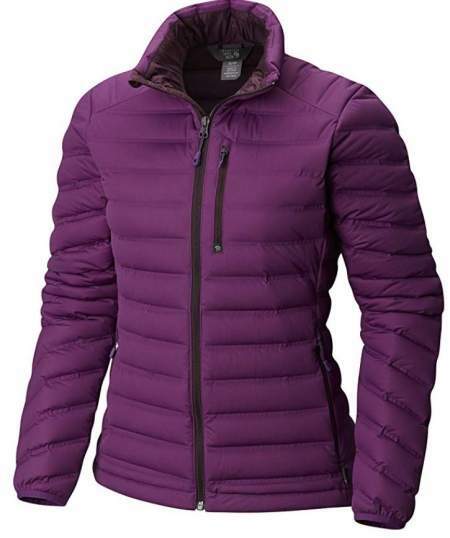 This Sierra Designs Women’s Whitney Jacket is with the same 800 DriDown power down fill, so these features are the same as in the Sierra jacket shown above. But from the picture, you realize that you have a generously insulated hood as well. The jacket is lightweight enough to be used under a rain shell jacket, but it is definitely warm enough to be used as a stand-alone external layer. Note that it is not waterproof. The shell material is a 40D Shadow Rip polyester. The liner is nylon. There are 4 pockets here, two zippered hand pockets, one zippered chest pocket, and one internal kangaroo pocket. It stows in one of the hand pockets. The center back length is 26 inches (66 cm), the sleeve length is 35 inches (89 cm) and the weight is 13.62 oz (386 g). The weight of the fill is 4.87 oz (138 g). The jacket is very suitable for hiking, climbing, snow sports, and backpacking. It may be important to stress that this jacket is also very affordable. What is down fill power 650, 700, 800, etc? You have seen above these numbers mentioned for each of the jackets. So what is the meaning? Note that this has nothing to do with the weight of the down insulation, I have seen some people get confused with this. This is about the volume of the down fill. In other words, the number 650 means the volume (in cubic inches) of one ounce of the down. The same is with the numbers 700 and 800. The highest number is 950, I do not remember seeing anything above this. So these numbers should be written together with the units in³/oz, but this is usually omitted hence the confusion. The bigger the number the more fluffy the down is, and this means also that it traps more air and this is what you want, it is the air that insulates you together with the down. So with less down, you can fill the same volume in a jacket’s baffles, and this means it will be lighter and more insulating. Note that currently down jackets do not come with an official EN rating which you have with sleeping bags. So you have to rely on at least two things i) the mentioned fill power, and ii) the amount of the insulation (down). The manufacturers normally give the fill power number, but the actual weight of the down used in the construction is not always given. In general, the more down the better, but think about the weight as well. There are other factors which help in keeping you warm. From my own experience, the construction of the collar on a jacket is very important, then you have the shell material, a hood adds to the warmth a lot, the cuffs closure, etc. Can 650 fill be equally warm as a 900 fill? The answer is yes. But for this, you would need more down with the 650 feature, and this means the jacket will be heavier. You can read more about this here. You have seen above that many of the jackets can be stuffed in one of their own pockets. This is amazing when you see how bulky they look. Though some have big pockets indeed! So the fill mentioned above plays a big role here. The bigger the number the better compressibility, you remember what I said about the trapped air in the fill. It is believed that a goose down has a better fill power in general. Apparently, this is because of larger down clusters. On the other hand, duck down is more available on the market and therefore less expensive. Now why this is so? Well, ducks are used for the food, humans eat. So I have no answer, but the fact is that the most expensive and top notch down jackets on the market are typically with a goose down. You have this term used for both down jackets and sleeping bags. The policy behind this is about the down being collected only after ducks and geese are slaughtered for food, and not by live-plucking. You know, I have grown up in a rural area and as a child, I have seen such plucking many times. Can tell you that geese can be very noisy in the process, but they remain alive after that. The truth is they are noisy in general. Such a live-plucking can be performed many times on the same duck of goose (before it is eventually slaughtered for the meal). This is thus about animal cruelty, and this is why we have the RDS concept. But if you are a vegetarian you might be skeptical about the whole idea. In any case, it is up to you, remember that there are also very good synthetic insulation jackets on the market. How to choose – down or synthetic? A hood adds weight and volume when the jacket is packed, and it increases the price, so if you already have it on your rain shell jacket, you might not need it. But you will want to have it if the jacket will be used frequently as a stand-alone external layer in cold weather conditions and with not much rain. Some brands have hooded and non-hooded versions so you might want to check. But a hood offers lots of extra insulation because your neck is protected as well, so you might want to have a jacket with a hood if this is about outdoor activities and the warmth is your concern. This may be different for a casual use, in this case this is more the matter of style. Note also that some brands build hoods to fit over a climbing helmet. This means more material, so do you really need this? Perhaps you would rather want a low profile hood with a close fit. You have seen the number with D (denier) in the descriptions of jackets. In general, the lower the number the lighter the weight but also the less durable and abrasion-resistant the fabric is. In those long parkas with lots of fabric, choosing a smaller denier value is crucial in trimming the weight. For the jackets in the list, the denier values are in the range 15D – 40D. So this is a sort of trade-off, to reduce the weight of a warm jacket, the manufacturers will use a fabric with a lower denier value and perhaps with a higher fill power. 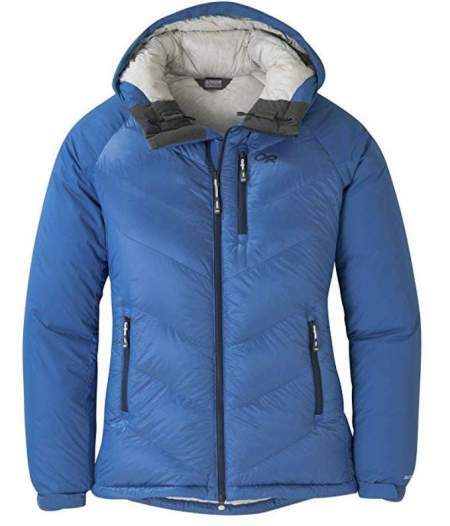 One typical example is the Outdoor Research Alpine jacket which is with 15D but also with 800-fill. If you inspect the list, you will realize that most of the jackets are not waterproof. The shell fabric is typically water-repellent but this does not mean it is waterproof. So this answers the question, usually they are not waterproof, but see the OR Floodlight parka. DWR (Durable Water Repellant) finish used on the external shell, regardless of if the jacket is waterproof or not. This helps a bit but not much. Waterproof and breathable membrane used for the shell fabric. This helps a lot, but not all waterproof jackets are very breathable. An outer rain-shell. This solves the problem of dealing with rain, but how about sweating? Treated down. This helps a lot, but you should better combine this with the previous levels. It all depends on how you plan to use a jacket and when. Where I go (and this is in the Alps most of the time), having a fully waterproof layer is a must. 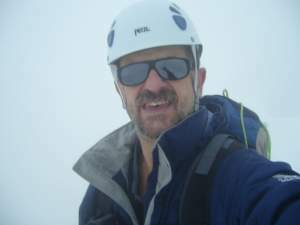 Though I go in the mountaineering season and not for snow sports, but it is always very high in the mountains and the temperatures are similar to winter. So I have lots of rain in the lower areas and snow higher in the mountains, see an excellent example from our tour to Bivacco Battaglione Ortles, we had all seasons in one day. See also my climb to Cima Solda in the same area of the Italian Alps, with snow in mid-summer. You can read more what I use in my separate text. If this is about a highly aerobic activity and you are sweating a lot, it is essential that the down is treated. But treated or not, down does not work well when wet. Though the technology is improving all the time and different manufacturers use different methods to make the down hydrophobic. This is why you have such terms like DriDown (in Outdoor Research jackets), Nikwax (in Rab jackets), Deluge (in the jackets by Patagonia), Q.Shield (in Mountain Hardwear jackets), etc. So this was my list with the best down jackets for women that are currently on the market. The list will be updated regularly as I spot some new and good jackets appearing on the market. So bookmark this page and check it from time to time. Now, how to choose? Here are some factors to consider. As you have seen, regarding the length you typically have i) hip-length jackets, ii) waist-length, and iii) parkas. The parkas are with long front zippers and probably not the best option for some sports activities. They are more for a casual use. Focus on the first two types if you need something for the outdoor activities. Most of the models can be used as stand-alone jackets or as mid layers under a shell. But again, the parkas are usually not so versatile. However, you have seen the OR Floodlight Down Parka, this is waterproof itself and you do not need any extra protection. If you are on the budget, as of the moment of writing this text, the Sierra Designs jackets are the most affordable models in the list. This may change when you read the text, so please check the links for updates. If you would rather have a synthetic insulation, then please check my list synthetic insulated jackets for women. But see also my list with interchange jackets for women, all of them are insulated jackets of a special kind, with removable insulation layers that can be used as separate jackets. Do you need something similar for men? If so then please check my list of insulated jackets for men. Thank you for reading. Do you think I have missed adding a great jacket in the list? If so, do let me know, I shall check what you suggest. Please use the comment box below. Have a nice day.